Safely store any type of wine with this easy how-to guide. There are a few rules in the "how to store wine" guide books that are worthy of writing down and remembering. All wines need to be kept cool, away from direct light, and in a stable location. Remember that oxygen is the enemy of good wine. Exposing wine to oxygen causes the process of oxidation to begin. Oxidation causes wine to spoil or age prematurely - a process that is similar to what happens when a fruit or vegetable rots. Storing wine in direct light causes it to age prematurely. This will adversely affect the flavor of wine. Wines store best in dark, cool places. This is why they've traditionally been stored in custom wine storage facilities, wine cellars, or wine racks, as well as closets and basements. A refrigerator can be a good solution. However, a refrigerator that is constantly being opened exposes wine to fluctuating temperatures and bright lights. The family refrigerator is not a good place to store wine long term. Many enthusiasts opt for mini refrigerators that are dedicated solely to wine storage. Most wines are packaged in special dark bottles that prevent light penetration, but even these do not filter out 100% of ultraviolet light. 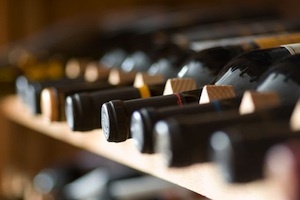 The optimal temperature for storing wine is 55 degrees Fahrenheit. Do not store wine above 55 degrees Fahrenheit or below 40 degrees Fahrenheit. Wine begins to oxidize at 75 degrees Fahrenheit. There should be no, or minimal, fluctuation in temperature. Keep fluctuations at three degrees or less. For example, temperature fluctuations between 48-51 degrees Fahrenheit are acceptable, but fluctuations between 40-55 degrees are not. Extreme fluctuations may expand the cork or compromise the seal. This causes wine to age prematurely and it negatively impacts flavor. Any fluctuations in temperature should be gradual. High humidity levels are important. The higher humidity levels (ideally between 65-75%) keep corks from drying out and shrinking. When corks shrink, oxygen enters the wine bottle, causing oxidation of the wine to occur. Avoid areas with constant vibrations, such as tops of refrigerators, spots near washing machines, motors or heavy traffic areas of the home. Wine should be stored in a place where it will be undisturbed and stable until you're ready to enjoy it. Storing a wine bottle on its side keeps the cork in contact with the liquid. This prevents the cork from drying out and shrinking. As mentioned above, when the cork shrinks, it allows oxidation to occur. If you plan to serve a particular bottle of wine within a day or two, it is fine to keep it upright in the refrigerator. For long-term storage, however, the bottle should lay on its side at a slight angle, with the cork end up. Storing wine near perishable fruits and vegetables may cause oxidation to occur, and the wine may spoil. 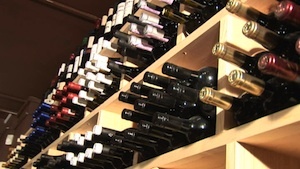 Storing corked bottles in a room or space near rotting woods may cause the cork to rot. Storing wine in an area with strong odors is not a good idea either, since the odors may be absorbed through the cork into the wine, adversely affecting flavor. Mold may form on wine that is kept in closed spaces with no ventilation. This is especially true for red wines. Store wine in an area that has good air circulation. Pour the wine into a smaller bottle and put a cork or vacuum stopper in it. The less air (oxygen) you leave between the liquid and the cork or stopper is better. You may remove oxygen from partial bottles of wine using a sparging system, with gasses like Argon and Nitrogen. Spray this into the bottle and quickly cork the top.